for creating accessible, tagged PDF files. provides a higher level of control. for export to well tagged and thus accessible PDF. 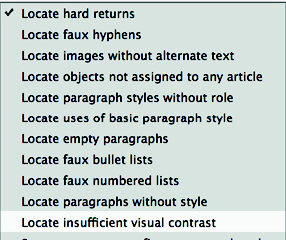 In addition, specific features are offered, for example to verify that text uses sufficient contrast. Export tags for semantic structure. like whether a piece of text is a paragraph or a title. 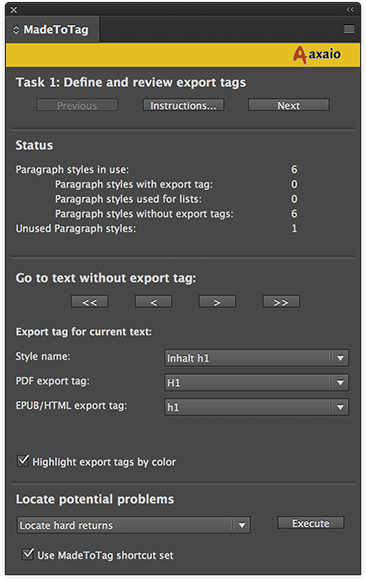 In order for export tags to work well, paragraph styles have to be used consistently across the document. For paragraphs and headings, export tags have to be assigned by the user. when exporting to PDF, but only if the respective features of InDesign are used. Assign export tags to paragraph styles. will not be an accessible part of the content structure in the exported PDF. - just leave the export tag at “automatic”. for example as a regular paragraph or a list. Please avoid headings inside tables as this is usually not adequate. 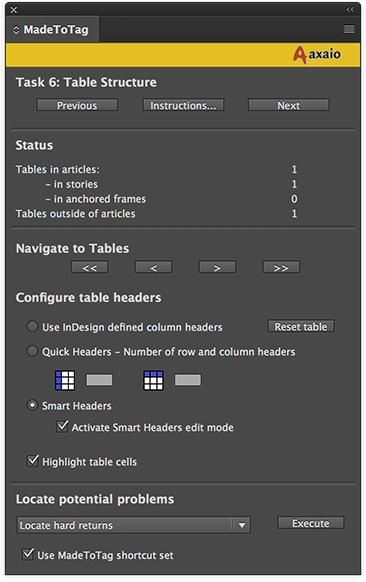 Instead, header cells in a table are configured through the table setup in Adobe InDesign. This will clearly mark the paragraph as a <Caption> in the PDF/UA. and mark it as <Caption> in the PDF/UA. (Only if a list structure immediately follows the paragraph tagged as caption). (Only if a table structure immediately follows the paragraph tagged as caption). This should be used if the <Caption> paragraph is above (at top of) the table. (Only if a table structure immediately precedes the paragraph tagged as caption). This should be used if the <Caption> paragraph is below (at bottom of) the table. This will clearly mark the paragraph as a <BlockQuote> in the PDF/UA. a single BlockQuote tag will be assigned. This will clearly mark the paragraph as a <Index> in the PDF/UA. single Index tag will be assigned. Reduce structure to predefined types. but instead exclusively use the pre-defined types, i.e. P, H1 and so on. Review export tags for paragraph styles. 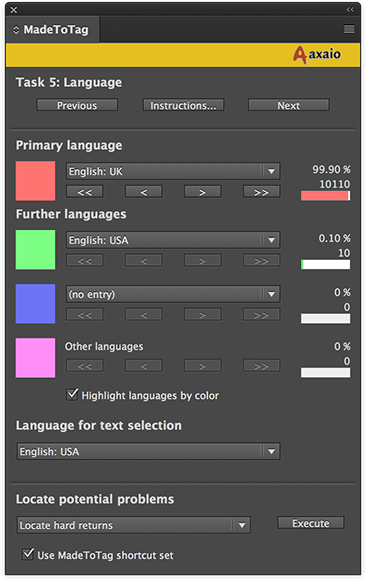 The color highlighting is only shown on screen and will not be visible in print output or exported PDF files. Establish correct content order by means of “Article” feature. in the order it will usually be consumed by a reader. MadeToTag provides keyboard short cuts to make creation of articles faster. the whole text chain is associated with the article, including all anchored frames in it. they first have to be turned into regular frames. Ensure all content is ordered in articles. depending on whether they are associated with the current article or any article or not. to make it easier to identify frames that still have to be associated with that article. The available possibilities can be found in the fly out menu of the MadeToTag panel. Review content order and semantic structure. use the “Show preview” feature (shortcut: Command-Shift-“V”). stylized structural view of the content of the current article. use “Preview for all articles” (shortcut: Command-Shift-“B”). Provide alternate text for images and graphics. Locate frames requiring alternate text. or Command-Shift-“B” for a structural preview of all articles. 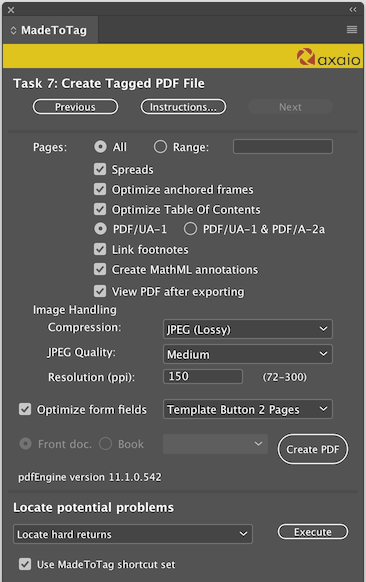 (for a dialog offering access to all metadata fields, use InDesign’s “File Info” feature). at least provide a meaningful document title. Further fields can be filled out as suitable. - it is important that all text in the PDF document is marked with the correct language. In InDesign this can be controlled through a language setting in the paragraph and character styles. Correct language settings also have the advantage to enable suitable hyphenation and spell checking. 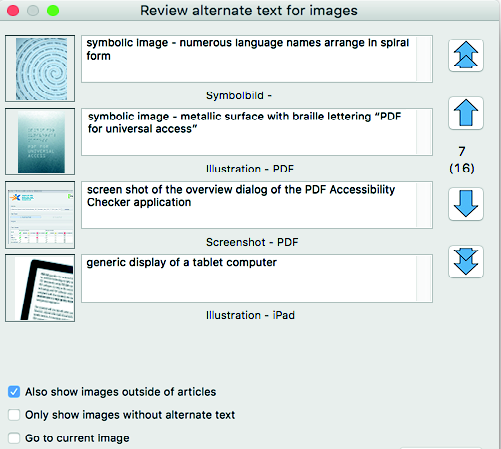 Review language settings in the document. 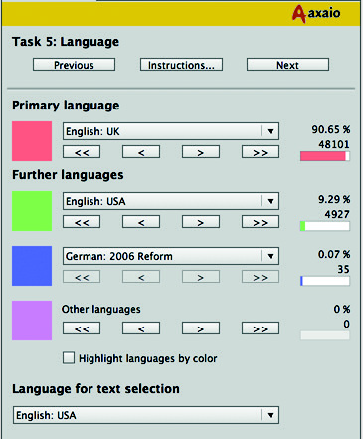 Locating languages in the document. the first, previous, next or last occurrence of that language in the InDesign document. Adjusting languages in the document. use the "Set language for current text" pop-up menu in the MadeToTag panel to set the language as local formatting. the language of text and paragraph or character styles of course remain available. MadeToTag makes it possible to tag tables for advanced navigation support. (often referred to as data cells). and in frames anchored in text frames belonging to an article. It also shows the number of tables that are not associated with an article. available tables and edit every table in order. The configuration area can be used to define how table headers are configured. This involves using the headers as defined in InDesign when creating the table. This is limited to column headers, row headers are not supported in this mode. Quick Headers are expressed as the number of row headers and the number of column headers. The values can simply be entered in the corresponding fields. The cursor can be used to select table cells. These are then highlighted in green. a header cell for the associated child or children. which serves as the header for some data cells. For this to function, the geometric position of the cells in the table grid is not relevant. possibly nested relationships between header cells and data cells. - just hold down the Shift key while doing Command-click. - only one parent cell at a time can be linked to one or more selected cells. Table is a 'layout table'. rather than to create an actual data table. to prevent confusion in the accessible PDF. This cleanup can be performed using the “Table is a 'layout table'” option. Generate the tagged PDF file. 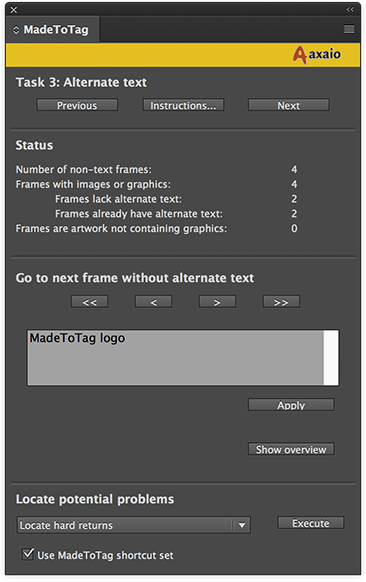 the MadeToTag panel provides its own tagged PDF export mechanism. 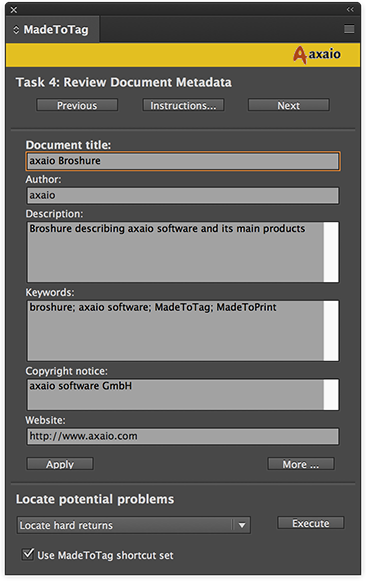 The MadeToTag tagged PDF export carries out several extra steps not otherwise available in InDesign. setting the default language of the exported tagged PDF, and so forth. Define the range of pages to be exported. Export document as 'Spreads' (versus 'Individual pages'). complex anchored frames being rasterized during export. 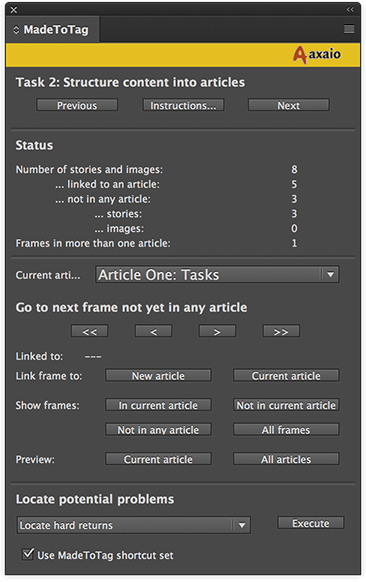 for the table of content created in InDesign. Export to 'PDF/UA-1' format or 'PDF/UA-1 & PDF/A-2a' format. 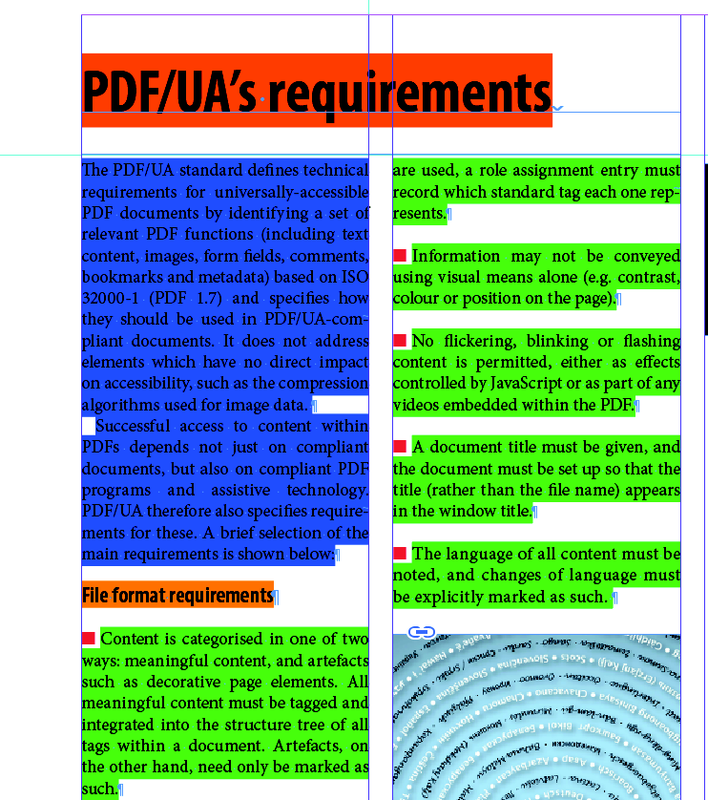 the PDF/A-2a file is PDF/UA compatible too). Link footnotes in PDF document. Display exported tagged PDF right after the export. Define the image handling for JPEG quality, compression, resolution. 'Optimize form fields' option can be used to adapt the PDF forms. complete InDesign book ('Book') as tagged PDF. The user has the choice to either export single pages or the book as a whole. a joint development by axaio software and callas software. Please find more information on pdfGoHTML and the free download here.